If you’ve been to the UK in the last few years, you won’t have been able to avoid the latest craze sweeping the nation. It’s a craze which seems to manifest itself everywhere: in shop windows, on T-shirts, in adverts – even in language blogs. And it’s one that has at its heart one very simple phrase. On the eve of World War II, the UK Government displayed posters across the country carrying the very simple plea to ‘Keep Calm and Carry On’. The message – simply stated and boldly written – was clear: to get through the war, the nation couldn’t afford to panic. After the war was over, the poster had surely had its day. But then, in 2001, some enterprising soul came up with the idea of printing new copies of it for sale. The rest, as they say, is history. Since then, the poster has appeared everywhere from office walls to football changing rooms. In particular, it has spawned all manner of creative parodies from ‘keep calm and have a cup-cake’ to the royal wedding inspired ‘keep calm and marry Kate’. Novel versions have appeared all over the place, from greeting cards to shopping bags. There is now even a website where you can generate your own. In fact, the country has been inundated with so many examples that some commentators have begun to wonder whether it’s time to stop ‘keeping calm’, and just stop. So, what’s behind the craze for ‘keeping calm’ and ‘carrying on’? Why has it been so popular? For many people in the UK the phrase will surely carry a very warm feeling of ‘Britishness’ – from the wartime reference itself, even down to the most Anglo-Saxon of linguistic features at the end: the phrasal verb. But, I would argue that the most important factor in the success of the ‘Keep Calm’ craze is in, in fact, the wealth of creative potential that the phrase itself provides. Because ‘keep calm and carry on’ is the perfect example to illustrate one of the most important mechanisms in linguistic creativity: creative linguistic variation. When it comes to language, creativity is not bound only to poetry and fine prose. Researchers like Ronald Carter at University of Nottingham have done much work to point out that linguistic creativity (the ‘art of common talk’, as he calls it) is pervasive in everyday life (Carter and McCarthy, 2011). As such, linguistic creativity can come in all manner of forms, including the use of figurative language (metaphors, similes and so on), puns and other word-play, jokes, careful placement of cultural references, general deviations from appropriateness, and even style-switching. In short, CLV means imitating and innovating, at the same time. And it’s probably something you do more often than you think. The metaphor employed in this sentence, ‘happy as hell’, is a good example of CLV. In itself, ‘happy as hell’ actually stretches the definition of metaphor since there are no obvious attributes of ‘hell’ (think ‘hot’, ‘firey’, ‘miserable’) that match the adjective ‘happy’. Instead of being built up from its component parts, the expression is therefore better explained as a variation on older, more fitting metaphors: ‘hot as hell’, perhaps, or ‘brutal as hell’. Of course, some of these are more novel than others, and some are more pleasing (my favourite is ‘Hollywood as hell’), but all are good examples of CLV in action. Some of the variations deviate little in terms of meaning (‘soldier on’); some echo the wartime routes of the original (‘fight on’); some add a subtle subversive spin (‘conform on’); and, some pun directly on the verb being replaced – at the same time creating new verbs from proper nouns (‘Carrie’ and ‘Karey’). But, all are good examples of creative linguistic variation. His point was a valid one: that, in political debate, the metaphors people use can influence, for better or for worse, the way in which we view the world. But what Orwell missed was that, when it comes to the everyday linguistic creativity, dead metaphors – as much as any well worn turn of phrase – are actually a fantastic source of novelty. So next time you feel your prose is missing something, just remember the productive art of creative linguistic variation. 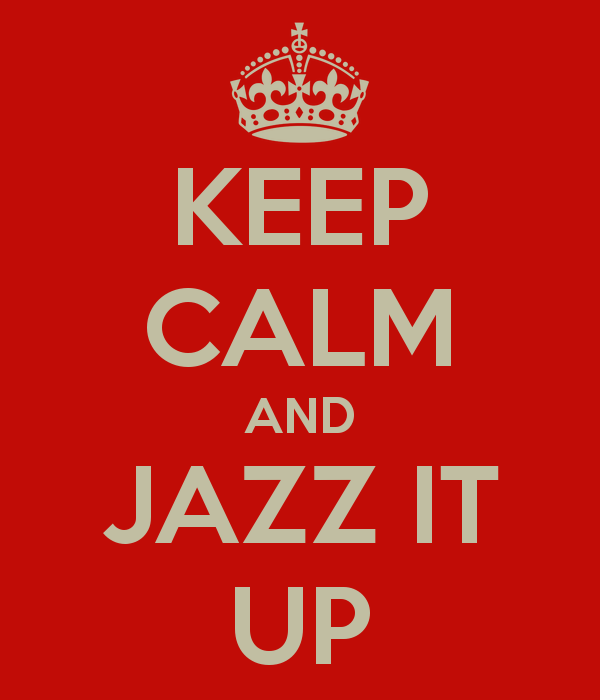 In other words: keep calm, and jazz it up. Carter, R. and Mccarthy, M. (2011). Talking, Creating. In Li Wei (ed.) The Routledge Applied Linguistics Reader (pp. 202-227). Oxon: Routledge. Orwell, G. (1946) Politics and the English Language. Horizon, 13, 252-265. Veale, T. (2012) Exploding the Creativity Myth: The Computational Foundations of Linguistic Creativity. London: Bloomsbury. This entry was posted in Uncategorized and tagged creativity, keep calm and carry on, language, linguistics, marketing. Bookmark the permalink. I don’t want any one to tell me to keep calm, especially when I’m not feeling calm. It just does not work. History of the versatile “Keep Calm and…….. series. Have wondered often where they all came from and this was a serendipitous find ! Gonna share it on my FB page. Reblogged this on Sarvesh Saraswat. Very interesting post that will have me considering CLV in my own writing. Keep Calm & Carry On Writing. I really like this, very entertaining! Awesome article! I didn’t realize the phrase Keep Calm came from the WW2 era, thanks for the lesson! Reblogged this on Pastry Co..
Reblogged this on Gracefully Hacked. I have asked numerous people the origin of Keep Calm… You are the first to explain. Thank you! Fantastic history lesson and the reference to Ronald Carter in one post! Love the idea that we could all look at these idioms and reinvigorate them into something quirky. Reblogged this on Elizabeth Carron | The Empirical Librarian. I have always been enamored by how ideas take off and the endless permutations that result. Etymology is more exciting than you would think. Language is constantly changing and more and more so as technology increases the ease of communication amongst different groups of people. I thoroughly enjoyed your article. Playful language, Orwell, and social commentary. That is my ideal read. Well done! Reblogged this on God's Masterpiece. Thank you for this history of “Keep calm and carry on.” I’ve been seeing it a lot lately but I had no idea that this was an old phrase from the war years. I had simply assumed it was a contemporary saying.